Info: The Solar System for iPad only. What does it do? Are you teaching your students about the solar system? 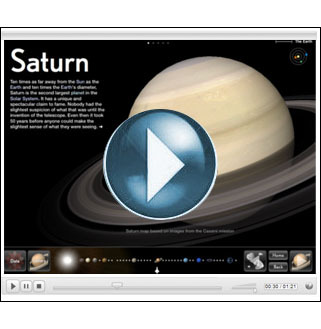 If so, this app presents your students with easy-to-read information about the planets and celestial bodies in our solar system, accompanied by interactive “touchable” 3D models based on real life NASA imagery. All the information is presented in a non-linear fashion and could be a beneficial approach for students who enjoy learning at their own pace. Last but not least, the intuitive interface is similar to The Elements app we reviewed in another blog post. Check out the video below if you’d like a quick demo of how it works! This entry was posted in Tools and Apps and tagged ipad, satelite imagery, solar system, solar system app, the elements. Bookmark the permalink.